This guest post by DAVID KING of Breaking the Frame looks back at how workers at Lucas Aerospace championed socially useful technology. It is a shortened version of a two-part article on the Breaking the Frame website, and feeds into a debate we’re holding this Saturday at the Anarchist Bookfair. Aerospace arms company to propose alternative socially useful applications of the company’s technology and workers’ skills, whilst retaining jobs. It was an inspiring model of industrial democracy and has played an important role in showing that traditional trade union concerns about jobs losses arising from closures in harmful industries such as arms, nuclear power, etc., can be met. The Plan was hugely influential in the 1980s peace movement, during the crisis at the end of the Cold War. But although younger generations of leftists, environmentalists and peace activists may never have heard of it, the ideas of the Lucas Aerospace workers are crucially relevant for the challenges we face today, including climate change, militarism and automation/artificial intelligence. A conference in Birmingham in November will both celebrate the achievements of the Lucas workers and, we hope, reinvigorate movements for socially just solutions to those crises. 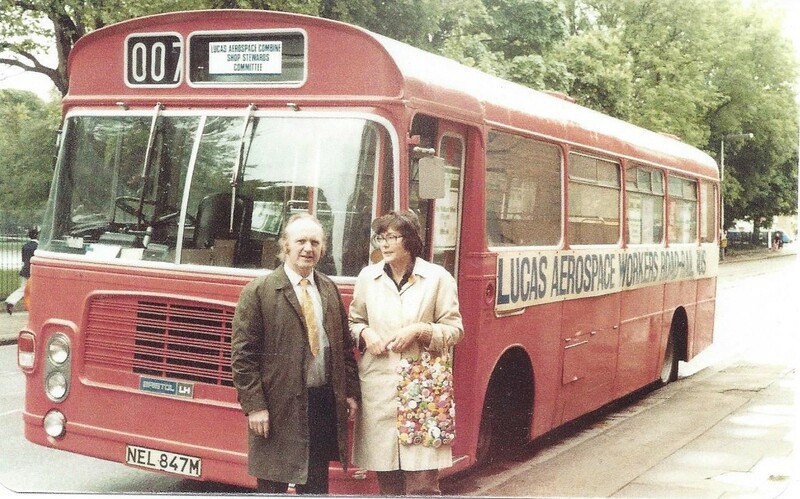 In the early 1970s the workers at Lucas had organised themselves into a cross-union Combine Committee, which had already been extremely effective in fighting redundancies. The Plan was driven primarily by the need to save jobs in the context of impending defence cuts and recession, but, drawing on the approach of the growing alternative technology movement, they went one step beyond resistance and beyond the conventional limits of “defensive” trade unionism, deciding to use their own technological expertise to design completely different products from those demanded by the existing market. The Combine Committee worked on the plan throughout 1975. It circulated questionnaires to the workforce requesting product suggestions which answered a social need and could be produced using the workforce’s existing skills and plant technology. One hundred and fifth product ideas were put forward by the workforce. From them, products were selected to fall into six categories: medical equipment, transport vehicles, improved braking systems, energy conservation, oceanics, and telechiric machines (i.e. machines that carry out manipulative operations under the control of a person who is not in the immediate vicinity). Specific proposals included an expansion in the production of kidney dialysis machines, ahead-of-their-time ideas like wind turbines, heat pumps and hybrid car engines, as well as the famous Lucas road-rail bus, designed to smoothly transfer between roads and rail systems. It is the positivity of the Lucas workers’ approach, and their emphasis upon socially useful production, that inspired millions of people in the 1970s and 1980s and sparked an international movement for worker’s plans. They were nominated for the Nobel Peace Prize in 1979 and Mike Cooley, a leading Combine member, received the Right Livelihood prize in 1982.
industrial technology tends to reduce workers to nothing but cogs in the production process, and by deskilling their work, takes away their bargaining power vis-a-vis management. In the 20th century, Frederick Taylor’s “scientific management” system of organising industrial production radically intensified this, and this issue was a central element of the fight at Lucas Aerospace. These battles over the technological organisation of industrial production were also a key part of the 1970s transition from the Fordist-Keynesian regime that began after World War II to the neoliberal-information technology regime that we still inhabit. Lucas was, in fact, a critical alternative possibility to information technology-neoliberalism, and that is one reason why it is so important that we learn its full lesson today. The production line system that was developed by Henry Ford, and which dominated the twentieth century, was based upon the ideas of Scientific Management, or Taylorism, developed by Frederick Taylor. Taylorism intensified one of the central processes of industrialism – the abstraction of workers’ skills and know-how and their embodiment in machinery and systems organisation. This allows the overall trend of capital intensification of production and the progressive elimination of labour. Taylorism took the form of “time and motion studies” in which experts minutely observed the movements of workers’ bodies in order to break tasks down, and create a system in which every second of the workers’ time was accounted for and “wasted time” eliminated; machines were designed to do most of the work, and workers became machine minders, performing repetitive and mindless tasks, requiring little skill. As always, the declared aim was a supposedly apolitical “increased efficiency”, but these systems also serve to discipline workers and reduce companies’ reliance on their skills and workers’ bargaining power. Taylorism is an example of the way that technological changes which open the possibility for new technocratic systems of order, shape the form that capitalism takes. The Fordist system of mass production of standardised products that Taylorism created not only defined workers’ experiences in industrialised countries for the first three quarters of the 20th century; it also defined many aspects of society. Fordism is a general hierarchical regimented system of social organisation (as described in Aldous Huxley’s Brave New World), that produces bureaucracy, “depoliticised” social administration by technocratic experts, as well as obligatory consumerism, the regimentation of time (the 9-to-5 job) and the general standardisation of life. By the 1960s this had become increasingly intolerable, especially to young people, who could see no prospect except mindless drudgery at work, a predigested culture and no freedom to express themselves. It was the revolt against this regime that drove the anti-authoritarian and even anti-science counterculture movements of the 1960s. The post-war period also marked a fresh wave of technologisation, driven by military research coming out of the war, as well as the demands of the Cold War. By the 1960s, Harold Wilson was speaking of the “white heat of the technological revolution”, which signified the beginning of globalisation and the shift of the basis of Western economies from heavy industrial manufacturing to high-technology and services. In industry, the creation of computer-controlled machine tools for metalworking across industries from aerospace to automobiles, chemicals, etc. produced a fresh wave of automation and intensification of Taylorist deskilling of work, as well as continual speedups, “rationalisation” within firms and job losses caused directly by technology. Union leaders, fearing charges of “Luddism”, bowed to the gospel of technological progress, but shop floor workers and even white-collar staff were by no means so docile. As David Noble describes in his book Progress Without People (Toronto, 1995), by the late 1960s, within the general social climate of revolt, union leaders and social democratic politicians could no longer contain an explosion of workers’ discontent and grassroots-led trade union militancy. This took many forms, ranging from skyrocketing rates of absenteeism and labour turnover, slowdowns and shoddy work, and wildcat strikes and sabotage, across the industrialised west, including the USA. Noble cites many more examples of trade union struggles around technology in European countries. Amazing as these might seem from the perspective of 2016, they were only one aspect of a deeper shift in the left, its overcoming of dogmas of progress through technology, and a focusing of its concern on the politics of technology. There was a flowering of “labour process theory” emphasising technological deskilling, such as Harry Braverman’s classic Labour and Monopoly Capital, and later by the writings of the Lucas Aerospace Combine Committee’s leading theorist, Mike Cooley. The US International Association of Machinists developed a Technology Bill of Rights, which states that “Uses of technology that violate the rights of workers and society will be opposed”. In response to the upsurge in militancy focusing on technology and the work process, corporations and the state developed a variety of strategies to contain and defuse it. In the USA and Europe, many companies created “job enrichment” schemes, and workers consultation and “participation” schemes aiming to moderate deskilling and authoritarian management. A new academic discipline arose, analysing work technologies and attempting to humanise the workplace and advise trade unions. In social democratic countries, there were often formalised “technology agreements” between unions and management, governing how technology was to be introduced. The Lucas Aerospace workers dismissed such initiatives as ineffective in protecting jobs: the Plan was a hard-nosed exercise in workers’ power: “There cannot be industrial democracy until there is a real shift in power to the workers themselves”. Although the Plan was never implemented, it was an effective weapon in preventing job losses at Lucas Aerospace – as they continue to insist. The Lucas workers also took more traditional defensive measures against the introduction of new technology, in line with the struggles described above. In 1980-81, the Combine forced the company to accept a moratorium on the introduction of new machinery at all the Lucas plants. During this period, the Combine Committee undertook consultation with workers of all types across the company, about how to deal with new technology. They also adopted other strategies, relying on the vulnerability that expensive technology created for the company, such as occupation and interruption of production, and the feeding of nonsense data into the company’s computers. It was against this background of political struggle around technology and the overcoming of the belief in the inevitability of technological “progress”, that the Lucas Aerospace workers developed their Alternative Plan. The workers’ own technological expertise gave the Alternative Plan great credibility and gave the lie to that central myth of capitalism, the idea of workers’ incompetence and that only technically expert middle-class managers can run the show. 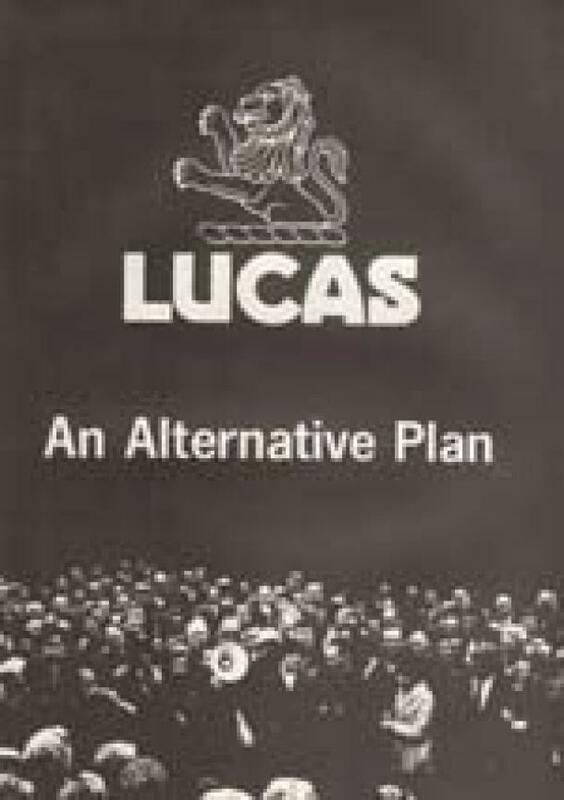 It was this political challenge to the Lucas managers’ “right to manage” that was the most revolutionary edge of the Alternative Plan, and it was probably this that led to its summary dismissal by the company. The Lucas workers, in terms of that old socialist slogan, were saying, “We don’t want more cake, we want to run the bakery”, and no-one could deny that they really could. They were also saying that they knew how to make better bread. But it is crucial to understand that the Lucas workers’ ideas about socially useful production were based upon their revolt against the Taylorist approach, through which capitalism had, for the last 70 years, been trying to make the myth of workers’ incompetence into a reality, by dumbing down their jobs with successive waves of new technology. At Lucas, faced with the concrete reality of new technology, there was little truck with the naive liberal notion that more high-technology means progress for workers or anyone else. Cooley’s book and a section of the Alternative Plan are devoted to criticising Taylorist management methods and the underlying dynamic of capital intensification that the Luddites also fought against, 160 years earlier. The Plan advocates what Cooley calls “human-centred technology”, designed to maximise the use and development of workers’ skills, thereby fostering their development as people, by giving them pride in their work and abilities. The Alternative Plan also emphasises the importance of “tacit” rather than formalised knowledge, the sort of know-how that resides in an experienced workers’ hands, their feel for the materials, rather than in the abstract scientific knowledge of technological experts. Cooley insists that all work involves both the use of the hand and the mind and that it is vital to overcome the division of physical and intellectual labour and the greater value accorded to the latter in technocratic capitalism. In the industrial model, especially since 1850, innovation is driven first by scientific discovery and design by technologists in a way that minimises the input of those who actually produce the products. This emphasis on skills and workers’ knowledge is central to their notion of socially useful and meaningful work (not just socially-useful products), and some of the Alternative Plan’s proposals were designed with this specifically in mind. Cooley even has the temerity to talk about “socialist technology”. In his book Architect or Bee, he gives a very interesting set of criteria for deciding whether products are “socially useful”: at least half of these criteria are about the process through which products are designed and produced and the impact of that process upon workers. The important point is that social usefulness is about a holistic concept of both process and product: there is no point in socially useful products that are produced in a way that oppresses and alienates those who produce them. In the 1960s and 70s, it was clear to radicals that the computer, which only existed as mainframes in the hands of state bureaucracies, the military, large corporations, etc. was a tool for the intensification of the Fordist hierarchical system of social control. In the 1960s to 80s, many leftist writers and other social critics pointed this out. Overwhelmed by the power of information technologies, the left has sadly forgotten these critiques. But if we are to undo the damage caused by neoliberalism, we also need to return to critiques of technology of the anti-technocracy movements and the Lucas Aerospace workers. This is one important reason for celebrating their 40th anniversary. In the 1970s, no-one could foresee the astonishing trick that capitalism was about to pull off with the personal computer: by putting computers in individuals’ hands, as well as those of corporate managers and bureaucrats, it would simultaneously dissolve the revolt against the rigidity and hierarchy of Fordism and apparently allow much greater individual freedom. The key point is that technocracy does not have to be top-down or rigid – it works much better and less obviously in the cybernetic mode that mobilises people’s energies rather than repressing them. But we should never fool ourselves that it has gone away – on the contrary, “post-Fordism” is really hyper-Fordism, in which Taylorism is, in fact, intensified. The economic neoliberalism that flowered in the 1980s is inseparable from the computer technology that underpins it, as exemplified in one of its early manifestations – the Big Bang of computerisation of the London Stock Exchange in 1986. Although we habitually speak of “neoliberalism”, that whole economic, social and political regime is inconceivable without information technology: we really should say, “information technology-neoliberalism”. It is computers that have enabled corporate globalisation and the deindustrialisation of Europe and North America, by creating the communication capacities necessary for managing global corporate empires. It is computers that have allowed the financialisation of the economy and the “magic” of derivatives which crashed it in 2008. It is computers and mobile communications that allow the zero-hours contracts “flexible economy” with its precariat, constantly glancing at their phones to see if they have work today. It is computers that allow us the freedom to watch 1000 TV channels and a million websites, thereby co-opting us all into the culture industry. And it is computers that continued the underlying dynamic of capital-intensification/ automation, which is creating the “squeezed middle” of angry Daily Mail readers. This trend is just as significant as anti-union laws and the off-shoring of industries in destroying trade unions, holding down wages, and magnifying economic inequality. Current predictions are that almost 50% of the jobs in the economy will disappear in the next twenty years, because information technology creates far fewer jobs than it destroys. In 2014, Google, valued at over £280 billion, employed just 46,000 people. Compare that to the £38 billion auto giant General Motors, which in the same year employed more than 200,000. Those in employment face the relentless speed up in both work and life that computers have imposed, and the resultant epidemic of stress-related diseases and other social pathologies. Today, we are in a different situation from the 1970s. The trade union movement has been disciplined and forced back on the defensive. The spectacular successes of electronics and information technology, and the technologisation of life that it has brought, have contributed to a wave of technocratic triumphalism, and a forgetting of the Lucas Plan. Nowadays, the highly political process of introduction of new technologies is referred to, even on the left, in depoliticised technocratic language as “technological change”, as if it “just happens”. But technocratic capitalism has not changed fundamentally, and there are strong continuities. The very success of information technology in automating more and more jobs, and the polarisation of wealth that has resulted from this are now reaching a new crisis: as in the 1970s, we have a fundamental crisis in the mode of production, and an ongoing financial crisis, resulting in the Brexit vote and the populist polarisation of politics that the technocrats thought they had finally overcome (remember Francis Fukuyama’s “The End of History” and Gordon Brown’s “No More Boom and Bust”?). Capital intensification is, as the Marxists have rightly insisted, one of those fundamental internal contradictions of industrial capitalism that always comes back to destabilise it. How can we respond to that crisis? One choice, which is gaining much support on the left, is to embrace more automation and provide a basic income for those useless human beings. Apart from their naive belief that capitalist technologies will liberate us, such proposals (see e.g. Inventing the Future: Postcapitalism and a World Without Work by Nick Srnicek and Alex Williams) seem to me to be “turkeys voting for Christmas”. They are based on a fatalism about the supposedly inevitable “advance” of technology, indeed, a capitulation to it, that the Lucas Aerospace workers and other militant trade unionists around the world did so much to fight, as did the highly successful anti-GM food movements in more recent times. Doesn’t it make more sense to address both the twin crises of work and environment (in reality, they are one crisis) by returning to the ideas championed by the Lucas Aerospace workers and others? We need to look again at what people really need and how those things could be produced in a more labour-intensive way that builds people’s skills and our society’s resilience. Breaking the Frame has produced a popular badge with the slogan, “Off your computers and onto the streets!”. Perhaps now is the time for a badge saying, “Off your computers and into the workshop!” And this time we mean a real hands-on workshop that produces things we need, not a place where people sit around in a circle and talk. We need to build a social movement of resistance to the imposition of new technology and for socially useful work. The crucial lesson of the Lucas Plan that has been largely forgotten by the more recent generation of the left is that the control of design of technology is a keystone of capitalist power. In order to really move beyond that, in order to really run the bakery, technology has to be designed to satisfy social needs, including the need for socially useful work. This means that both the technical know-how, and the critical understanding of the politics of technology that workers have, is essential to any efforts towards a post capitalist technological as well as social and economic world. 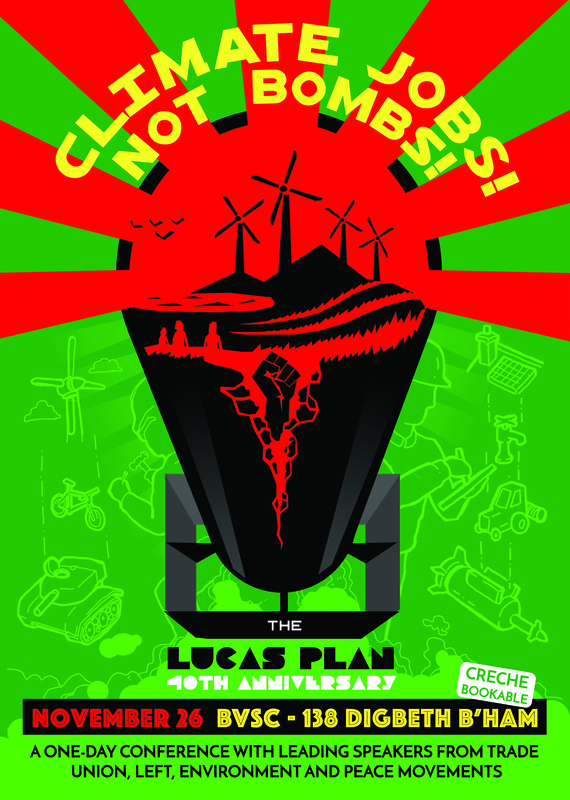 The key significance and credibility of the Lucas Plan is its holism: it envisions not just a new society, but a new system of production premised upon a critical politics of technology. The alternatives are stark. Either we will have a future in which human beings are reduced to a sort of bee-like behaviour, reacting to the systems and equipment specified for them, or we will have a future in which masses of people, conscious of their skills and abilities in both the political and technical sense, decide they are going to be the architects of a new form of technological development which will enhance human creativity and mean more freedom of choice and expression, rather than less. The current crisis of industrial capitalism and political reactions to it, such as the Brexit vote, are very frightening to many people, and conventional politics seem incapable of facing it. But it is also an opportunity for positive initiatives based on remembering and hope. It is a chance to think again about how we run this bakery. Our conference in November will be a chance to continue that process together. 26 October 2016. K. Robins and F. Webster, Times of the Technoculture, (Routledge, London, 1999). Mike Cooley, Architect or Bee? The Human Price of Technology, (Spokesman, London, 2015), p. 154. See e.g. F. Webster and K. Robins, Information Technology: A Luddite Analysis: Post-industrial Society or Capitalist Control? (Ablex, London, 1986). Mike Cooley, Architect or Bee?, p. 180. This entry was posted on Wednesday, October 26th, 2016 at 5:52 pm and is filed under Crisis of capital, Science and technology, Social and labour movements. You can follow any responses to this entry through the RSS 2.0 feed. You can leave a response, or trackback from your own site.